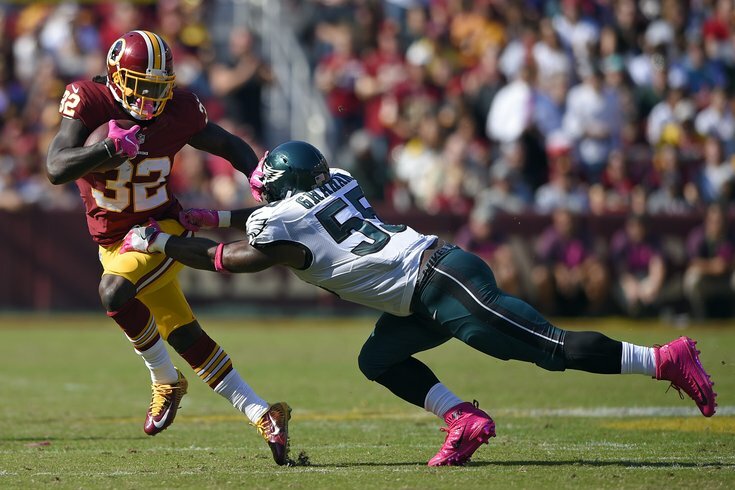 Washington Redskins running back Rob Kelley, left, pushes away Philadelphia Eagles defensive end Brandon Graham during their Week 6 matchup. Things are supposed to be easier the second time around. But even though this is the second edition of Eagles vs. Redskins over/unders, it's hard to feel any more confident about the outcome of this meeting than it was when these two teams squared off in Landover back in Week 6. Maybe that's not entirely true, given that Jimmy Kempski, Rich Hofmann and I all predict an Eagles loss on Sunday. However, that doesn't necessarily make my job of setting the over/unders any easier, largely because we don't know how they're going to get to said outcome. In their last meeting, the Eagles surrendered a season-worst 230 rushing yards, something no one saw coming against a defense that at that point was among the best in the league at stopping the run. And as bad as their defense played in that one – they allowed nearly 500 yards of offense – it was the defense, along with Dave Fipp's special teams unit, that actually kept them in the game with a pair of return touchdowns. After all, you're going to need some help from them when the offense fails to find the end zone and manages just 239 yards of total offense. Furthermore, rookie quarterback Carson Wentz struggled in the loss and was sacked a season-high five times, and he hasn't really looked the same since. He had seven touchdowns and just one interception prior to that game. Since he's thrown just five touchdowns compared to 10 interceptions and has seen his rookie passer rating drop over 23 points (103.5 to 80.1). Now, losers of three straight for the first time all season – they've also lost seven of their last nine games – the Eagles will look to get back on track when they host Kirk Cousins and the Redskins at the Linc in their first NFC East game of the season at home. Here are some numbers to keep an eye on during the game. That's the current point total being offered at topbet.eu. Based on our staff predictions, we're leaning towards the under. For much of the season, the under was the safer bet in Eagles games because their offense was consistently scoring in the 20s and their defense was among the NFL leaders in points allowed. Over the past few weeks, however, that's flipped. It's been their opponents that have done the bulk of the scoring while Wentz and the offense have struggled to an average of 14 points over the last three weeks. They've also failed to score more than 24 points in any game since Week 3. The Redskins, meanwhile, have averaged 29.3 PPG over their last four and have posted 500 or more yards of offense in three of their last five games. However, they've also allowed an average of 26.5 PPG over the last month, which would suggest these two teams hit the over. But with what we've seen out of the Eagles offense recently, there's not much reason to believe post the number of points needed to push the over. Don't forget, they got a pair of scores from the defense and special teams in the last meeting and still managed just 20 points. Oh, and the total in that one? You guessed it: 47 points. You had to know this one was coming after the Birds surrendered 230 rushing yards to Washington in Week 6. Believe it or not, that's 19 percent of the rushing yards Jim Schwartz's defense has allowed all season, thanks in large part to the fact that they've held their opponents under 100 yards on the ground in eight of their 12 games, including four of their last five games. This one could have a lot to do with how the game unfolds. If the Eagles again find themselves trailing early, Washington shouldn't have a problem surpassing their season average of 109 yards as they try to run the clock and preserve their lead. That being said, the Redskins have one averaged 71.5 rush yards/game the last two weeks, but in their five games prior (starting when they hosted the Eagles in Week 6), they averaged 147.8 yards per game. They're also fifth in the NFL with 4.5 YPC. For as efficient as the Redskins offense on their ground, their defense is just as bad. They're allowing an average of 4.6 yards per carry, something that could bode well for an Eagles offense that has been in desperate need of a lead running back. Hopefully, the return of Ryan Mathews will give them just that, and allow them to establish a ground game and potentially open things up for Wentz. Prior to the Eagles loss to the Packers two weeks ago, the Birds lowest rushing total of the season was their 94-yard performance against Washington. But in each of the last two weeks, they've set a new low, hitting bottom with just 53 yards (16 of which belonged to Wentz). The Birds may still be averaging 109 yards per game, but that's being bolstered by their strong start to the season. Over their last eight games, the Eagles have topped 100 yards just three times and 115 yards just once (208 vs. ATL). Head coach Doug Pederson talked quite a bit this week about trying to reestablish a ground game, but he's also still trying to win games. So if the game starts like so many have recently, with the Birds down early, it's going to be difficult for him to remain committed to the run. This is the other reason the Eagles need to get going on the ground. Wentz has been throwing the ball far too often for a rookie. Last week against the Bengals, he dropped back to throw 63 times. And that wasn't a good look, especially without his leading receiver, Jordan Matthews. He's averaging close to 45 pass attempts per game over his last six games compared to fewer than 31 per game through his first six starts. And while those numbers seem to be trending in the wrong direction for the rookie, he did register a season-low 22 attempts in his first game against the Redskins -- and the results weren't any better. He completed 11 of those throws for a 50 percent completion percentage (both his worsts of the season) and was sacked the five other times he dropped back to pass. Wentz hasn't attempted fewer than 36 passes in a game over the last six weeks, but this could be end of that streak. We know there's something not quite right with the Eagles front seven, and while you may look at this and think it's a ridiculously low number, consider the following: the Eagles failed to record a sack and got just one takeaway in their Week 6 loss to Washington. Sure, they responded with 10 combined (6 sacks, 4 takeaways) against the Vikings the following week, but over the last six weeks, the Birds are averaging just two combined sacks/takeaways per game (6 sacks, 6 forced turnovers in 6 games) and would have hit the over just once in their last three.